ADATA presents the new XPG SPECTRIX D41 DDR4 gaming edition memory modules with TUF Gaming Alliance certification that ensures compatibility with ASUS TUF motherboards and aesthetically complements the TUF Gaming Alliance styling found on other brands as well including Cooler Master, CORSAIR, In Win, and Thermaltake. 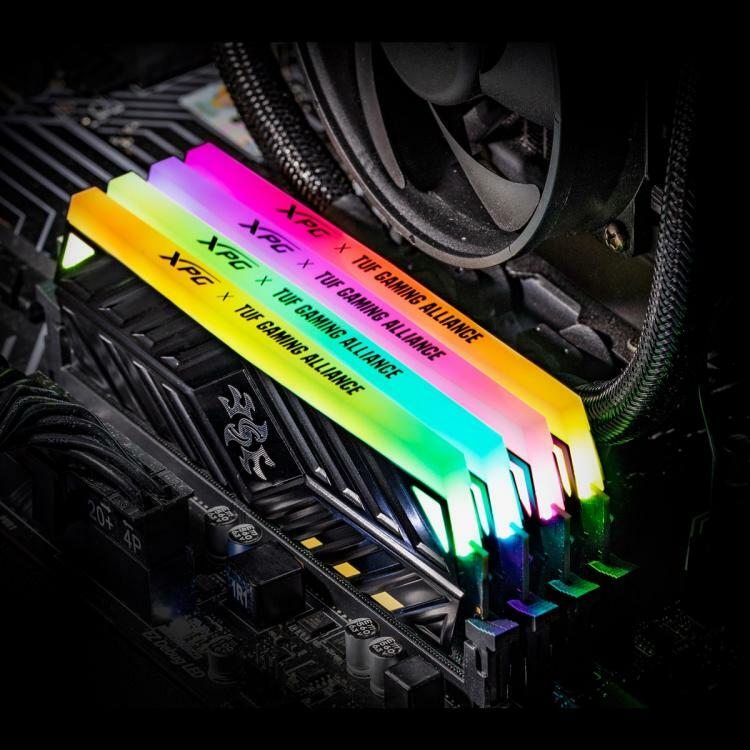 The XPG SPECTRIX D41 comes with a black heat spreader with yellow trimming and sync-enabled RGB lighting via the ASUS Aura Sync. The XPG SPECTRIX D41 TUF Gaming Edition memory sports aggressive-looking heat spreaders that fit the TUF Gaming Alliance theme along with its impressive performance for demanding gamers. The top lightbar is exposed for the ultimate glow along with customizable lighting effects where you can setup pulse speed, patterns, lighting intensity and more. The memory’s RGB lighting can also be synchronized and customized via the ASUS Aura Sync RGB lighting control software. The XPG SPECTRIX D41 TUF Gaming Edition memory is perfect for demanding gamers with kits up to 3200MHz frequency. The SPECTRIX D41 TUF Gaming memory also supports the latest Intel and AMD platforms with support for Intel Extreme Memory Profile (XMP) 2.0 on Intel platforms for easy overclocking. The XPG SPECTRIX D41 TUF Gaming Edition memory is built with high-quality flash memory to deliver reliable performance fit for the ASUS TUF Gaming motherboards. The memory also features a custom-engineered heat sink and multi-layer PCB that ensures greater stability and improved data transfer quality. ADATA covers the XPG SPECTRIX D41 TUF Gaming Edition memory with a lifetime warranty. No information on pricing and availability as of this writing. Learn more about the SPECTRIX D41 TUF Gaming Edition DDR4 memory here.